The University of New England recently presented two former students with Distinguished Alumni Awards for outstanding leadership, professional and personal qualities. 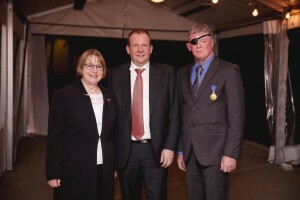 Vice-Chancellor, Professor Annabelle Duncan, presented Grant Hehir and Michael Smith AM with the awards at a cocktail function held in Canberra last week. Commonwealth Auditor-General, Grant Hehir, was recognised for his extraordinary contribution to the betterment of governance and, through it, the lives of all Australians. Mr Hehir came to UNE in 1979 to study economics and subsequently completed his honours with the financial assistance of a cadetship from the Commonwealth Department of Treasury. Mr Hehir said that it was a great surprise and honour to be presented with a UNE Distinguished Alumni Award. Professor Mike Smith, a preeminent archaeological expert on Aboriginal histories and the reconstruction of past environments in Australia’s arid regions, was recognised not only for his rigorous research in the field but also for outstanding exhibitions at the Australian National Museum designed to bring this important cultural history to a wider audience. Professor Smith was conferred a PhD from UNE in 1988 and was recognised in the Australia Day Honours list as a Member of the Order of Australia in 2013 for significant service to archaeological scholarship, particularly of the Australian desert regions. UNE Distinguished Alumni Awards was introduced in 1994 to acknowledge noteworthy alumni contribution to their profession and/or community at a local, national and international level. Previous awardees include Dame Margaret Ogilvie AC, The Honourable Dean Brown MP and Mr Bruce Bonyhady AM.